If you're thinking about tooth whitening, you want to know about any possible teeth whitening side effects! First, let me say that take-home tooth whitening systems bought from a dentist' office are perfectly safe. There has been a TON of research into tooth whitening since the 1970's, and DENTIST SUPPLIED whitening systems are completely safe. BUT there is one thing you must avoid: whitening systems used by some NON-DENTAL tooth whitening businesses which contain chlorine dioxide. Chlorine dioxide is acidic, and can etch or dissolve the surface layer of tooth enamel, leaving it rough and dull. As far as I am aware, there are NO dentist-supplied products that contain chlorine dioxide. That's why I recommend whitening gels from a dentist, or from a top-quality online supplier, such as SNOW Whitening. So what are the teeth whitening side effects that you might expect from dentist-supplied systems? Sensitivity. 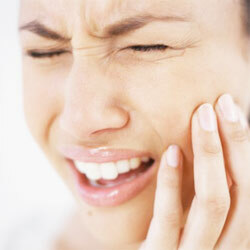 Teeth sensitivity is easily the most common side effect of whitening. BUT it's important to know that any sensitivity you may get is usually limited to the time while you are actively whitening your teeth. Once you stop using the gel, any sensitivity will settle down and your teeth will return to normal. You can minimize any sensitivity by being really careful about the amount of whitening gel you put into your splints. Most folk put out too much! You only need a small drop of gel, about the size of a grape seed, in each tooth space. Also, taking 600mg Ibuprofen ("Nurofen") at least one hour before you do the whitening will help too. Enamel dehydration. This isn't really a problem - it just makes the tooth enamel look whiter than it really is. The effect wears off within a day or two, and you will then see the true color of your teeth. This dehydration effect is why the one-hour "laser" whitening at the dentist's office can look impressive at first, but then wears off quickly. Most of the whitening you see in those first minutes after a "laser" whitening session is due to the enamel dehydrating. The teeth look whiter because it becomes more opaque. But as the enamel rehydrates again with saliva, the normal color returns. Enamel mottling. This is a side-effect of enamel dehydration. It looks like small white flecks within the enamel. You tend to notice it with take-home systems after a couple of days worth of whitening. After stopping the whitening process, this mottling disappears, and the tooth enamel returns to it's normal appearance, only whiter! Sore Gums. If you using a little bit too much whitening gel, and it gets onto your gums, it can cause some irritation and a white appearance, fading to red. If you see this, don't do any more whitening for a few days, and take some Ibuprofen. Your gums will return to normal within a day or so. There will not be any permanent damage. But use less gel next time! Dry Mouth. This may happen if you are using a whitening system for overnight use. Prolonged wearing of the whitening splints at night may cause you to breath through your mouth more, resulting in a dry mouth. The solution here is to try wearing the whitening splints for a shorter period, say 1 to 2 hours maximum, during the day. It has been found that most whitening gels are pretty much spent after 60 minutes. After that time, they are just neutral, and are having no further whitening effect. So 1 hour maximum is all you need, to get most of the whitening effect from a single application! For my own patients, I even recommend taking the splints out after 45 minutes. The only system I recommend that you can get online is the SNOW whitening system. Tooth whitening side effects are always of short duration and more of an inconvenience than anything else. There are NO teeth whitening side effects that are permanent, unless you have used chlorine dioxide on your teeth. The only thing that remains long-term is the whiter color!